On the heels of winning a victory for Oregon wild horse mares, threatened by dangerous sterilization surgery, comes yet another win for the wild ones. The U.S. Court of Appeals Tenth Circuit upheld a lower court’s dismissal of a lawsuit filed by the State of Wyoming against the Bureau of Land Management (BLM) seeking the removal of hundreds of wild horses from public lands across the state including mustangs from the Stewart Creek Herd. Ironically, Quinn and I were visiting the Stewart Creek mustangs with Lynn Hanson, my friend and fellow wild horse advocate, when our attorneys learned of this second victory. Being out here with these beautiful, family and freedom loving icons of the West reminds me of why we fight. Their home is over 230,000 acres of sagebrush valleys and windswept rims along the Continental Divide. The first time I saw the colorful Stewart Creek wild horses, it was the dead of winter. Ann Evans and I were driving from Riverton to Rawlins, and we were thrilled to see a family band just a short distance from highway 287/789, about 20 miles north of town. Winters are bitter and long in Stewart Creek. The foals above didn't seem to mind. 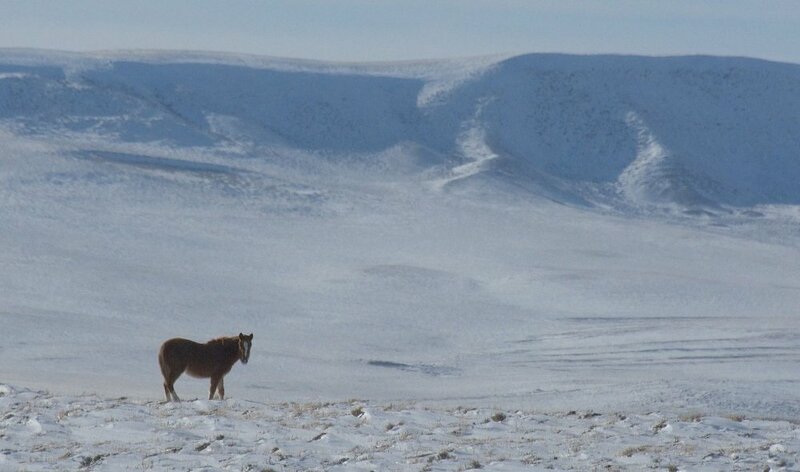 We saw this lone mustang in his huge home during our winter drive-by. He, too, was not far from the main highway. I imagine his friends were just out of sight below him. When I left Stewart Creek a few days ago, there was a colorful group of five bachelor stallions only 100 yards or so off the highway. It was grand to see them in nearly the same place as the winter ones. We encourage you to try your hand at finding them. If you have a high clearance vehicle, you can enter the range on a number of sandy roads. Take your binoculars to verify that these often distant dots are real wild mustangs! P.S. As a bonus, you are likely to see hundreds of fleet-footed pronghorns and a cottontail or two. Quinn was particularly fascinated with the rabbits!